is a place of peace and serenity nestled near the crossroads of the Midwest. Your gateway to the enlightenment of Spiritualism. The present stone entrance and gate house replaced the old as Camp Chesterfield grew in stature in the twenty-first century. 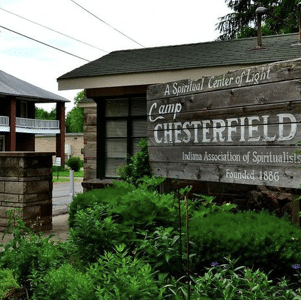 The Indiana Association of Spiritualists (IAOS) and Historic Camp Chesterfield have been a part of Indiana’s unique and varied religious history since 1886 when the IAOS was first formed. From 1890, Camp Chesterfield has served as the Spiritual home for the association, as well as for countless numbers of Hoosiers who have passed through its gates. Architecturally unique, Camp Chesterfield is listed on the National Register of Historic Places by the United States Department of Interior. Our 44 acre campus is one of the largest communities of Spiritualists in the US and the largest in Indiana. Whether you are looking for a retreat center for rest, relaxation or spiritual renewal, or looking to attend classes with like-minded people, we invite you to check out our website and special events. We have our own Hotel, Book & Gift Store, Trail of World Religions, Chapel, Cathedral, Garden of Prayer, and Labyrinth. We offer a comprehensive spirit-infused learning environment with classes on Spirituality, Spiritual Healing, Mediumship (developing spiritual gifts) and Metaphysics. Come visit us, we’d love to see you! Contact the Board by email or by phone at 765-378-0235. ‣Indiana I-69 – (South from Fort Wayne, North from Indianapolis) to Exit 234 (Anderson/Muncie). ‣Travel West on SR 32 to the third traffic light (Washington Street). ‣Turn North or right onto Washington Street.